It is unequivocal that passionate, informed volunteer scuba divers (citizen scientists) can contribute valuable information to document the biodiversity of the world’s oceans and consequently help promote their sustainable management. 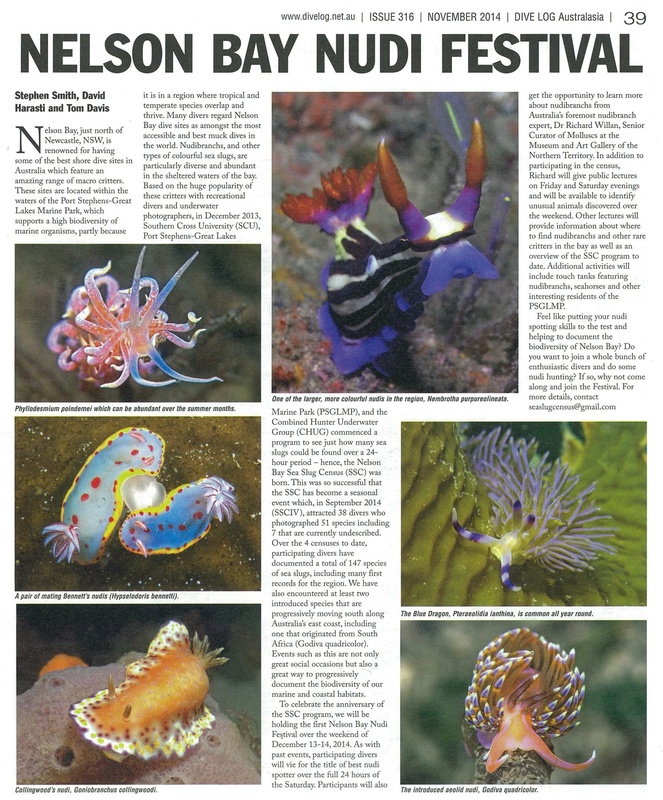 Despite their uninspiring common name, sea slugs probably arouse more passion among scuba divers than many other animal groups with myriad nudibranch images posted to social media sites and dominating many post-dive conversations. Sea slugs make very good indicators of climate change because they are highly visible and are (relatively) easy to identify? They are sensitive creatures and their breeding levels are an indicator of ocean health. One group, the nudibranchs, have very short lifecycles, so most live for much less than a year. As populations turn over quickly they can respond to changing environmental conditions. The whole idea behind this particular project is to generate awareness about these beautiful creatures and then use them to monitor the health of our marine environment. Citizen scientists have joined forces with Southern Cross University's National Marine Science Centre and Underwater Volunteers NSW to research the importanant role community volunteers, in this case scuba divers and snorkellers, can play in recording and identifying sea slug diversity at a number of locations on the eastern seaboard of Australia, specifically at Sydney, Port Stephens and the Gold Coast. As an example of just one census click the following link and read a DiveLog article on what eventuated when citizen scientists converged on Port Stephens in September 2014. Sea Slug Census' have been conducted on 14 occasions at Port Stephens, the first being in December 2013, then quarterly ever since. Results from each census and an album of images can be accessed on the Combined Hunter Underwater Group website.To date over 100 divers have participated in the program recording 148 sea slugs including 21 species that had not been previously recorded in the area. Want to be involved? The following requirements must be met. The geographic range each census encompasses will be notified prior to the event. For example, in Sydney it is from Port Hacking to Pittwater inclusive, with Bare Island as the main census site. Take one or more photos of each species of sea slug you find in the 24 hour period (12am-11.59pm) on the date of the census within the defined geopgraphic range. You don’t need to identify the slugs, just take their photos! Select one image for each species that best indicates its overall morphology. Crop the photo around the sea slug so it is nice and clear. Shrink the images to around 640×480 pixels. Download a results form, fill it in and email it together with your photos to the email address indicated by the organising dive group before the due date. Be sure to include the names of the dive team and dive sites. The UVNSW Facebook page, as well as individual Underwater Research Group's FB pages, will advertise upcoming Seas Slug Census' events. Use the links on these FB pages to register for events and download results forms.